We are a start-up which develops low-tech solar desalination plants for rural areas with saline groundwater. We want to build the desalination plants with the people on-site to give them access to salt-free and unpolluted water and enabling them to produce further plants on their own. Start of our project was in 2013, when Raphael won the TUM DeSal Challenge with his prototypes, a contest for the development of solutions for a sustainable way of desalinating sea water at the TU Munich. Afterwards Raphael started aquaba as a students project at the Deggendorf Institute of Technology. There we developed and tested prototypes until the EXIST Business Start-up Grant enabled us to launch the start-up in 2018. Our team is based in Deggendorf and consists of two graduates and one student of the Deggendorf Institute of Technology (DIT), all trained in the field of environmental engineering. Raphael started in 2013 by implementing the aquaba project in Deggendorf, developed the first prototypes and made an experimental study of the transport coefficient in thermal membrane distillation for his master thesis. Niclas joined the team in 2016 for his bachelor thesis about the retaining of bacteria during the process of thermal membrane distillation and is currently writing his master thesis. In 2017 Christoph joined the team and made a feasability study and market analysis for our solar desalination module in his master thesis. Since 2018 we have our own office at the DIT and work full time on our project. Together with Engineers without Borders and Oxfam we want to install solar desalination units in Colombia and Iraq. On March 20th and 21th, we did a workshop with the Engineers without borders in Luxembourg. They want to install approx. 50 solar desalination modules on an island in Colombia. A few days later, we presented the technology to the national Water-Sanitation and Hygiene (WASH) cluster of Iraq. Together with the Iraq Response Innovation Lab, we want to start a solar desalination project in Southern Iraq and Northern Iraq. From March 10th until 14th we held a entrepreneurship and solar distillation workshop in Erbil. The participants are entrpreneurs. The topics were business planning, marketing and technology. Some participants are planning to setup solar distillation devices by themselves now. These young entrepreneurs from Kurdistan joined our intensive workshop on solar distillation. The workshop consisted of five days and we spoke about business planning, marketing and the technology. Some participants of the workshop are planning to setup a few solar distillation modules in a small village in Kurdistan by themselves. This is the beginning of solar distillation in Iraq, that could create jobs in the private industry and improve the drinking water supply. Thanks for the organization by the Bavarian Entrepreneurship and Advanced Training Program and that we could do this event in the Iraq Response Innovation Lab. The cooperation with these two organizations is amazing! On January 13th 2019 we presented our business model. The EXIST scholarship is going to end in two months. Thanks for the great support from the startup campus in Deggendorf, especially to Prof. Thomas Geiß, Mr. Christian Schläger and to our mentor Prof. Robert Mnich. On February 8th 2019, we presented our desalination module at the Kenya Skills Show 2019 in Nairobi. On February 8th 2019, we presented our desalination module at the Kenya Skills Show 2019 in Nairobi. There we shared the stand with the Don Bosco Schools from Nairobi and Makuyu. We had interesting talks and made new contacts which may evolve into future projects. David from Don Bosco Technical School Makuyu will represent us today and tomorrow, feel free to visit our stand. Karibu! Started local manufacturing and distribution of solar desalination modules in Iraq. Approximately 4 million people in Iraq suffer from water salinity and contamination in summer. In Iraq approximately 4 million people, especially in the south and central Iraq, suffer from water salinity and contamination in the summer. Therefore, Raphael from aquaba visited northern Iraq in January. Now we develop a project to manufacture and distribute the solar desalination modules locally in Iraq together with Oxfam Iraq, the University of Kurdistan Hewler, Alaq Annajah Company and other organizations/companies. Two modules were manufactured locally and setup at the Iraq Response Innovation Lab and at the University of Kurdistan Hewler. January 6th, 2019: Prof. Dr. Atrooshi and Prof. Dr. Al-Salihi from the University of Kurdistan Hewler and Raphael Wagensonner met in Erbil. 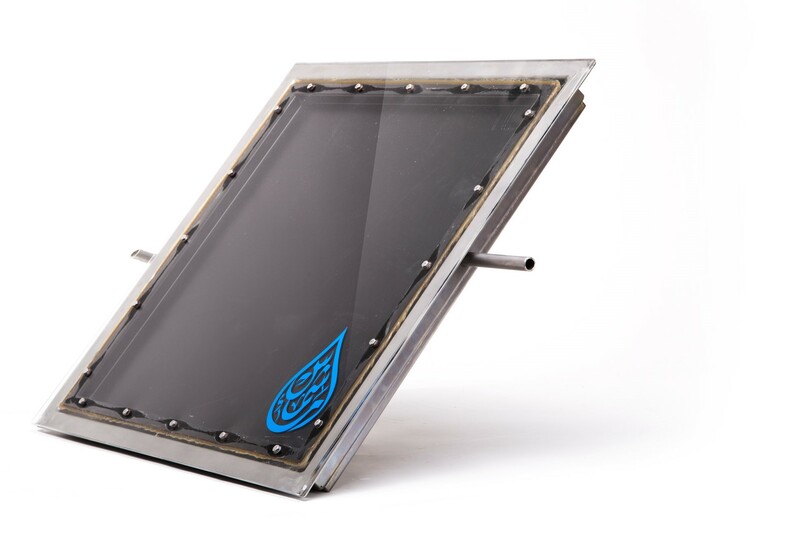 aquaba manufactured two solar water desalination devices. On January 6th and 9th 2019 Raphael Wagensonner visited the University of Kurdistan Hewler in Erbil, Iraq. The European Training and Technology Center (ETTC) in Erbil helped us find a manufacturer of stainless steel products. In just a few hours this stainless steel company produced two solar water desalination modules. There was also a successful meeting with the German chamber of commerce in Erbil. The University of Kurdistan Hewler, the ETTC, the manufacturer and the German chamber of commerce are great hosts. Thank you for the meetings. On December 6th 2018 Mr. Thomas Erndl, member of the Bundestag, came to our office in Deggendorf. Mr. Thomas Erndl is a member of the Bundestag and a member of the foreign office committee. In this committee he is the correspondent of the East Africa region. Further he is the vice chairman of the foreign culture and education policy comittee. On December 6th 2018 he came to our office in Deggendorf. We showed him our solar desalination modules. Christoph Dobler and Niclas Dehmel spoke with him about the pilot project in Pundamilia and Makuyu in Kenya. Raphael Wagensonner presented our financing plan and lead a discussion about the next steps. Mr. Prof. Dr.-Ing. Robert Mnich contributed with his professional background to this meeting. The artisans from the Don Bosco Technical School and aquaba set up a small solar desalination plant for the Sisters of Mary in Pundamilia, Kenya. December 1th, 2018: During the last three days we dug a trench for the salt water supply (despite the stony ground), connected all the tubes for salt and fresh water and adjusted the panels straight. This was possible thanks to the help of Bernard, Boniface, David, Harisson and Laurence. We were happy to present the final setup to Sister Sushma today. We started putting up our modules in Pundamilia. November 28th, 2018: Today we started putting up our modules in Pundamilia. During the next days the pipes and other equipment will follow. Stay tuned! Construction of solar distillation modules with the artisans of the Don Bosco technical school in Makuyu, Kenya. November 12th, 2018: This week we started continuing our desalination training course at the Don Bosco Technical School in Makuyu. Today Boniface, David, Bernard and Laurence (f.l.t.r.) constructed the second module. They are students and a teacher of electrician and plumber classes. By the end of this week the required glass sheets will be delivered and we will start the first test run. The objective of our workshop is to make a salinated well in Pundamilia usable again by removing salt, flouride and boron from the groundwater. November 16th, 2018: Today we started our first test run at the Don Bosco Technical School in Makuyu. The module ran from 9 am to 5 pm and produced 4.1 litres. The surface area is 0.825 m², so we exceeded our goal of 0,5 l/h with even less than one square meter. We reduced the conductivity of the water from 3027 µS/cm to 3 µS/cm (average tap water has 400 – 600 µS/cm). The water in Pundamilia, where we will put up the modules in the future, has a conductivity of 7580 µS/cm. More modules are constructed and we will put them up next week for futher testing. On November 5th, 2018 Christoph and Niclas arrived in Makuyu, Kenya. On November 5th, 2018 Christoph and Niclas arrived in Kenya with our friends from Servir e.V. and had a great start so far. In the next days we teach students from the Don Bosco Technical School how to build our panels. The whole region suffers from salty groundwater which makes the wells useless. With this project we want to enable the people in this region to build their own desalination modules, so that they are provided with fresh water during dry season. On our facebook page we posted a video where you see the team of Servir e.V. and aquaba together with the Sisters of Mary in Pundamilia. Our first modules will be set up on their School. We will provide you with more information during the next days! We made third place at the HOCHSPRUNG-Award. On Wednesday, 17th October, we made third place of the HOCHSPRUNG-Award 2018, a start-up business competition throughout Bavaria, funded by the Bavarian Ministry of Science and Art. Cooperating with Servir e.V. for a pilot project in Kenya in the end of 2018. The NGO Servir e.V. and aquaba will start a solar desalination-training project in the social centers of Pundamilia and Makuyu, Kenya. In this part of Kenya the groundwater is saline and thus the people suffer from water scarcity in the hot months. To provide these people with drinking water we want to start a pilot project with them. It is the goal of the pilot project to enable the local companies from Makuyu and Pundamilia to build and maintain solar desalination devices by themselves. Servir e.V. are teachers and students from the Maria Königin high school in Lennestadt, Germany. They gathered through great social activities money to support the construction of a school and a health center in Pundamilia. Our first trip to Kenya is hopefully in October or November. Since May 2018 we receive the EXIST business start-up grant. EXIST is a support program of the Federal Ministry of Economics and Technology (BMWi) and the European Social Fund (ESF). It supports students and graduates in preparing innovative start-up projects in cooperation with universities. We receive the scholarship from May 2018 to April 2019. With the funding we can cover our costs for coaching, traveling, investment and salary. 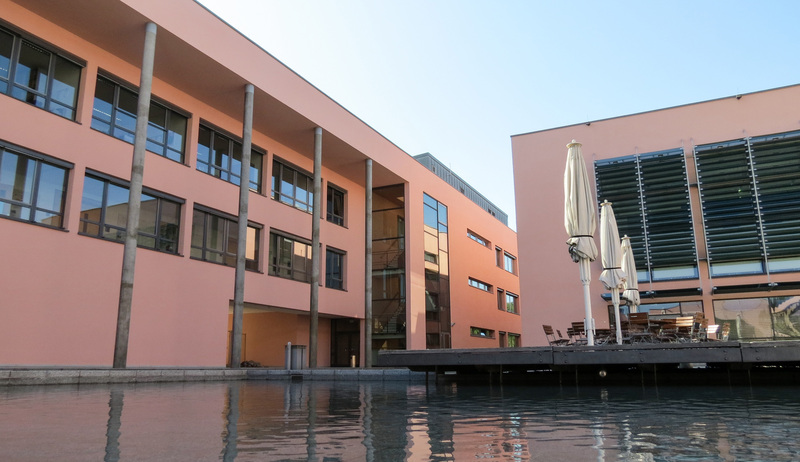 To work on our project the Deggendorf University of Technology provided us with an office space in the D-building. Come and visit us in D005! Three trips to Egypt to develop the solar desalination plant. Trip 1, September 2017: Our first potential customer was Mr. Sherif Mehany from Port Said, Egypt. He told us when we were still in University in 2016, that there is a need for simple solar desalination technologies. He invited us to Port Said to build a solar desalination plant. This was a great motivation for us to start aquapa in May 2017. We started testing and developing our solar desalination plant here in Germany before Raphael Wagensonner went to Port Said in September 2017. Mr. Sherif came up for all expenses of the trip and cared about Raphael Wagensonner very kindly. It was at a place of Mr. Mohammed, the husband of Mr. Sherifs sister, that we could test five different solar still plants. These plants were not working well, that’s why we had to improve our plant back in Germany. Trip 2, January 2018: Christoph Dobler and Raphael Wagensonner return to Egypt to meet Mr. Sherif and attend the Cairo Climate Talk. When we built the plants in September at the site of Mr. Sherif, he realized that our technology is not ready for the market yet, that is why he did not push our project on the second trip. Nevertheless, he was a great host once more in Port Said to us. We went to Cairo to meet Mr. Prof. Hosam Shawky at the Desert Research Institute and Head of the Egyptian Desalination Research Center of Excellence. We showed to him and his colleagues our prototype. For another three days, we tested the plant at the Desert Research Institute. Further, we tested the plant at our hotel and made a promotion video. The highlight of this second trip to Egypt was the Cairo Climate Talk. This event was hosted by the Germany Embassy and the Egyptian Minister of Environment, H.E. Dr. Khaled Fahmy, delivered a speech. Together with four other green startups we had a discussion in front of around 200 guests. There we met for example the startups Hikers, who make wheat out of mango residues and beena, a startup with the focus on green technologies like solar dryers. Trip 3, April and May 2018: In four weeks Raphael Wagensonner built several solar desalination prototypes in Cairo with Beena and could test two modules at the Red Sea in the Marsa Alam Diving Resort, that sponsored the accomodation. This trip confirmed that the setup is easy and all materials are available in countries like Egypt.